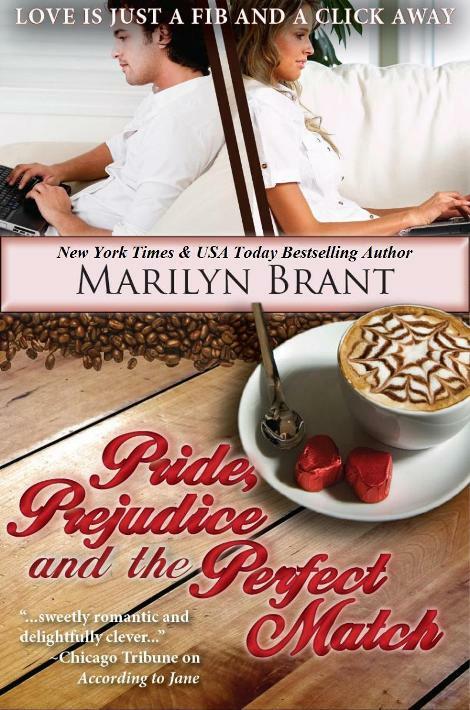 I hope you enjoy this excerpt of the book (copyright Marilyn Brant 2013)! Beth Ann Bennet typed “male” in the box that indicated which gender she was seeking. Her best friend and fellow classmate, Jane Henderson, leaned over her shoulder and studied the university library’s computer screen in the afternoon sunlight. The cursor blinked, and Beth’s level of nausea rose with each flash. “So far, so good,” her friend declared. Jane flashed a grin of discernible pride, which was combined in equal measure with deviousness. Beth’s spirits sank a notch lower. Why couldn’t she be more like her best friend? Jane was light years ahead of her in the deceit department. She keyed that in also, her pulse picking up speed. Jane rolled her eyes in response. Beth closed hers before threading her fingers through her tangled mop of light-brown hair. She felt the split ends snap. there were necessities like bread and peanut butter, staple items for a mom with a six-year-old. If everything went as she planned, maybe by June she could justify an appointment. She opened her eyes and glared at the listing of eligible men, reminding herself that she had to choose one. They swam through her range of vision while the lyrics to “Looking for Love in All the Wrong Places” flooded her brain. She tried to block out the tune and focus on the faces of her research subjects. Who’d make the best candidate? Beefy was right. He had muscles the size of overgrown cantaloupes. And, oh, he preferred blondes. “Except he’s proud of his Streisand CD collection, his Chia Pet and his Virgo perfectionism. These things could throw off the hypothesis.” Beth sighed. “What do you think of Number 37?” Beth said. Jane wrinkled her upturned nose. She centered his profile on the screen. Read the bio. Reread it while Jane’s giggles bubbled around her. Heaven help her, but Number 49 was The One. “Definitely falls into an acceptable salary range,” Jane agreed, pointing to the numbers listed in the right-hand column. Beth shuddered. The things she had to endure in the name of science. Well, social science. But perhaps Jane was right. If she had to do this final Sociology 369 “Gender and Society” project, and if she was in the quarter of the class that had to use the Internet as her main research tool, she might as well choose a subject who was at least tall, dark-haired and gorgeous. Nothing stereotypical about her own mate selection, of course, she thought. The irony of it brought the day’s first grin to her lips. Hello, Will. I’m a twenty-two-year-old child psychology major, Beth began. She glanced back at her friend. Beth nodded. I love the outdoors and particularly enjoy playing softball, she typed, and then grimaced at the blatant lies. The guilt was already eating at her, but she had to think of her son. Nothing could get in the way of her providing for Charlie. “The only thing about you that frightens me is your insatiable gambling habit.” Will leveled his most disapproving stare at the guy but, as usual, his cousin ignored him. Will turned his back on his favorite and only cousin, who—at present—he wanted to strangle to within a millimeter of the rich party boy’s life. He pitched the remains of their lunch in the trash then loosened his tie. “I know you don’t believe me, but I’m looking out for your best interests here, Cuz. Before I plunk my money into some do-good operation, I want proof that you’ve finally gotten a life outside of this, this…morgue.” He waved the arm with the Rolex attached to it in a wild loopy arc. “Evidence that you’ve scored a little balance in your daily life—among other things.” He waggled his brows suggestively. Will marveled at how a guy who resembled him physically could act with all the subtlety of a Saturday-morning cartoon character. Will thought of the one woman he wanted, no, needed to win this wager with Bingley. Charlotte Lucas. If only she could be as amazing in person as she seemed online. A youthful but professional twenty-two-year-old future child psychologist. Bright, humorous and a sports enthusiast with a warm heart. Someone who’d fit in perfectly at the clinic, if he’d gauged her right. And someone he could tolerate for five dates outside of it. She’d described herself as being five-foot-six with light-brown hair and brown eyes, but she held the advantage. She’d seen him—a scanned picture anyway—but he had yet to see her. Maybe, just maybe, after three weeks of cautious emailing, that’d change tomorrow. The clinic’s funding depended on it. Still, this was a hell of a way to make a few million bucks. “They don’t come any stranger than you,” Will muttered, their standard childhood reply. “I heard that.” Bingley smirked, his fingers scoring his thick brown hair, his lean legs sauntering on his way through the sliding doors. Will sighed and took to the stairs. The guy never changed. There was always some weird bet, some eccentric agenda in Bingley’s quest to “feel needed” or whatever. But this time the ends might justify the means. Will tucked the flap of his shirt into the dress slacks he’d worn for the administrative meeting today and readjusted his tie with a scowl. He missed his scrubs but formalities had to be observed with the hospital board. “Oh, how you do go on!” She looked away, her head and hands shaking, feigning disbelief, but he could see teeth. She was grinning big. Parkinson’s. Stage Two. He struggled to close his mind to it and move down the hall. The pain of dealing with deteriorating elderly patients would chew him up if he dwelled there. Even though the low-income moms he liked to work with were often in dire straits, it was still less agonizing to watch than the suffering of the elderly. He slid into an empty room and flipped on the computer. He had huge plans for his clinic. He just needed to get the hospital’s final stamp of approval, which he could get if he could secure the rest of the cash. The board had said so. To get the cash, though, he’d have to get Bingley onboard. To get Bingley onboard, he’d have to get Charlotte Lucas. He scanned his list of unread email messages, but didn’t see anything life-threatening in the subject lines. Clicking on Charlotte’s email address, he typed what he hoped would be a hard-to-resist invitation. Will proofed it for errors, took a deep breath and clicked SEND. made by Heather (one of my very talented readers), especially for this novel! !